We have been literally burried in snow in New York. Well, truthfully, some snow and then a whole lot of slush. I've been wearing boots every day to wade through the water that collects at the street corners. Nothing like what my mom has been experiencing in Boston, however. They have many feet of snow and have had intermitent power and lots of wet, heavy snow to shovel. I am still inspired by winter whites. Despite the inconvenience, the snow is so pretty when it first hits. Waking up to white and quiet is lovely and it makes me want to be in the woods. Chilly weather doesn't demand cold foods but I enjoy using my gelato maker and perfecting my mixes. I love how forgiving gelato is: you can play with the milk to cream ratio according to your preferences and seem to end up with something wonderful no matter what happens. Gelato sometimes has egg, but I have found it to be unnecessary. Stracciatella has always been my favorite flavor. It's so pure and you can really appreciate the quality of the ingredients. As such, I stick to fresh farmer's milk, plump vanilla pods and organic raw cane sugar. My only regret is that the capacity of my gelato maker is not very high - but that keeps me making it fresh and also probably helps control the urge to devour a huge batch in one sitting. Combine milk, cream, sugar, and vanilla seeds and pod in a heavy sauce pan and heat gently until sugar dissolves completely. Allow mixture to cool to room texture. Remove vanilla pod and refrigerate mixture until well chilled. Pour into gelato maker and operate according to manufacturer's instructions. During the last five minutes of the cycle, add chopped chocolate and allow to distribute throughout. Put in a freezer-safe container and press a layer of freezer or parchment paper on top of mixture before you seal the container lid. Freeze several hours or overnight. p.s. what does the chili have to do with all of this? nothing! yum and I was just about to make chocolate ice cream - but this looks much better! Even in snow I could eat this ice cold gelato. 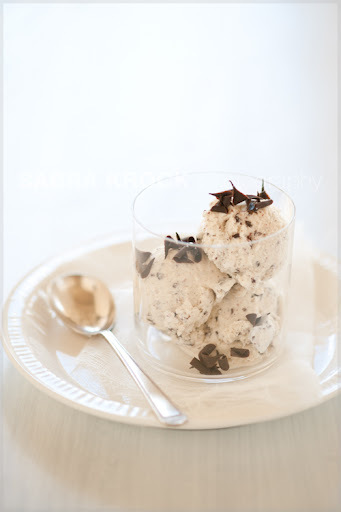 I love eggless ice cream recipes. For years I thought all ice creams made at home had to be custard based. It's liberating to make something so light. 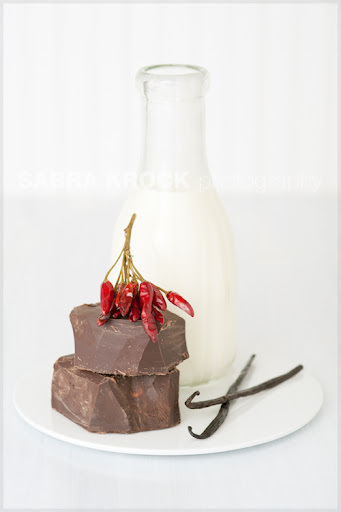 The white milk bottle on the gradations of white background with the chocolate and peppers is spectacularly beautiful. I think I'll be shopping for some vanilla beans! Just gorgeous, and I've no doubt that it's delicious too. This dessert is just perfect! I love it! What absolutely beautiful photos! 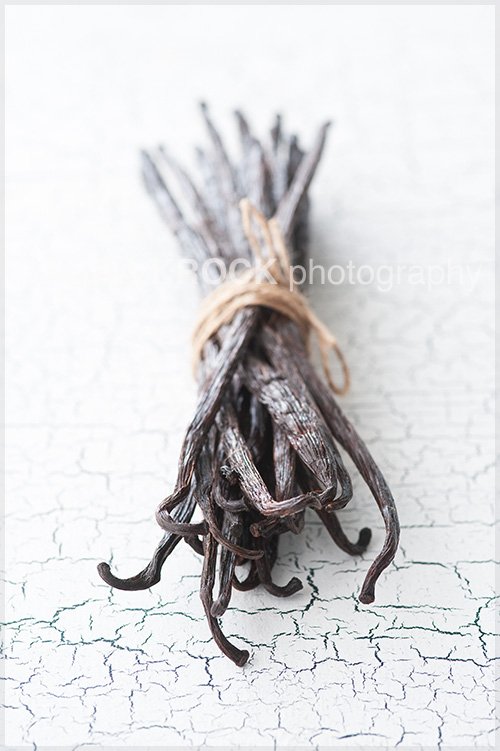 the vanilla beans are just perfect...I really enjoy gelato and will have to try making stracciatella sometime. Thanks - your site is an inspiration! I love reading your blog! Truly inspirational. Have tried my hand at ice cream but never gelato. What kind of machine do you recommend? your pictures are so beautiful ! I just found your blog and I absolutely love it! My own blog pales compared to yours! Just wanted to drop in and say hello and hope to get to know you more through your work! Love your photography! Consider yourself blog rolled!